Ayurveda To The Rescue! Here Are 9 Patanjali Products You Should Try! Ayurveda forms the root of traditional Hindu remedies for all sorts of ailments. Conservatively, ayurvedic potions and concoctions were heavily relied upon for skin, hair and health. The beauty industry globally is going through change and looking back to more natural, holistic approaches and ingredients. In a world of parabens and sulphates, very few brands claim to be 100% organic. Patanjali, owned by Baba Ramdev has quickly taken center stage in India and become one of the largest, fastest growing FMCG brands. 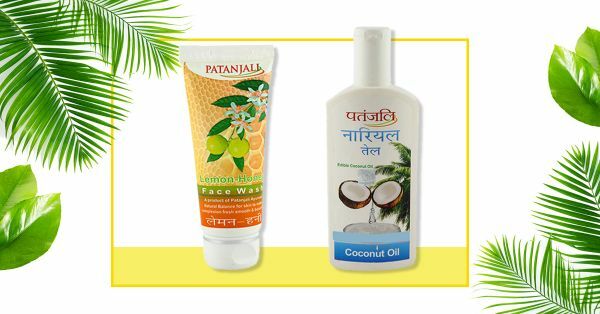 Patanjali has now ventured into the space of cosmetics, food items, personal care, and health care products too! Backed by Baba Ramdev, the brand has earned the trust of millions of Indian consumers, rural and urban. If you’re on the lookout for some great Ayurvedic products, organic and pure - you may just find something you like in the Patanjali product basket! Check out our list of Patanjali products worth trying out. This is a budget-friendly rose water that can be used in your face packs and body packs, you can also use this as a toner and a facial mist to refresh yourself on the go. It’s pretty versatile and travel-friendly. Rose water helps to balance the pH levels of your skin and also helps fight acne, blemishes and oiliness. Multani mitti is one of nature’s best cleansers. If you’ve ever used it on your face, you already know how great it is for oily skin, clearing up acne, fading tan and brightening up your complexion. The patanjali body soap contains multani mitti for healthy, spotless skin all over your body. This one’s a little drying so make sure you moisturise afterwards. The Saundarya aloe vera gel is a blend of saffron and sandalwood to moisturise, protect against sunburn, tanning, dark spots and blemishes. Regular use will ensure that your skin is more even toned, glowy and spot free. It’s pretty lightweight so if you don’t have extremely dry skin, this would be a good option for a summer moisturiser. Sandalwood and saffron also help people with acne-prone skin. The Patanjali saundarya face wash is enriched with orange peel, neem, tulsi and aloe vera. It’s a great everyday face wash for people with normal skin. It’s very gentle on the skin and effectively removes oil and dirt. Neem and tulsi protect the skin from any infections. This coconut oil is pretty versatile, it’s edible too so you can actually use it on your skin and in your food too. If you’ve grown up in India, mom’s coconut oil champi never gets old. Coconut oil is pretty amazing for the body too, try cooking with it to reap maximum health benefits.Try this one out for goodness inside and out! Aloe vera gel is used for almost every ailment, cuts and burns, insect bites, tanning, acne, blemishes. It’s a great moisturiser for your face and body, especially in summers. You can even mix a bit of coconut oil into the gel and make a paste and apply it to your hair as a lightweight hair mask. The Patanjali coconut hair wash is great for people with dry, dull hair. It’s very effective in adding moisture to your dry tresses while gently cleansing. The coconut oil in the shampoo will help fight dandruff, hair fall and rough hair. The patanjali honey is 100% pure and organic, you can add it to face masks and also drink it with some warm water first thing in the morning. Honey is a natural humectant and an antioxidant that helps your body and your skin heal and refresh.